Bahama Patio doors, or sliding doors, are ideal in situations where you wish to have a large uninterrupted view of the outside from the inner living space. They offer a contemporary way to bridge the gap between your home and garden while still insulating your home from the chilly British winter using argon gas filled low emissivity sealed units combined with warm edge spacer technology. This maximizing of the view never means compromising on quality as high technology hardware options ensure the best security ratings in the market. These can be "Secure by Design Accredited". Bahama UPVC patio doors are virtually maintenance free and are very light to glide due to multi twin wheel carriages on stainless steel tracks. Maybe it is time to replace those tired old silver aluminium or sticking timber patios of yesteryear with something that will give you and your family years of trouble free joy backed by the best guarantee available today. All installed by a qualified, well trained company of over 40 years standing. Our patio doors are manufactured using the highest grade materials and to the finest of tolerances to provide a tight seal that keeps the winter's chill and summer's heat at bay. They offer the highest level of security available for in-line patio doors and have been designed to meet the exacting requirements of the Police's 'Secured by Design' initiative. 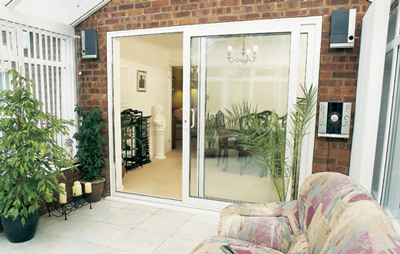 Bahama offer an aluminium low threshold option on its patio doors, featuring a ramp on either side of the patio door. This will enable easy access for wheelchair users. FREE DOWNLOAD - Secured-by-Design's "Guide to Security Standards for Doors & Windows"
Customer recommendation on patio doors via Checkatrade "Courteous, well explained, very efficient and work carried out to high standard."